This page holds images taken from the observatory at the Indian Institute of Space Science & Technology. 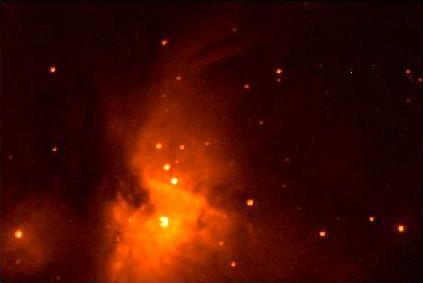 Orion Nebula (M42) as seen through a Balmer-alpha filter with an exposure of 10 seconds. Orion Nebula (M42) as seen through a red filter with a 10 second exposure. Orion Nebula (M42) as seen through a blue filter with a 10 second exposure. The Orion nebula is a star forming region in our Galaxy at a distance of approximately 1,600 light years. The region has several low and high mass stars of less than a million years of age (young, compared to astronomical time scales). The above series of images were taken with the SBIG CCD camera coupled to the 8 inch telescope. Each image was taken with a different filter. 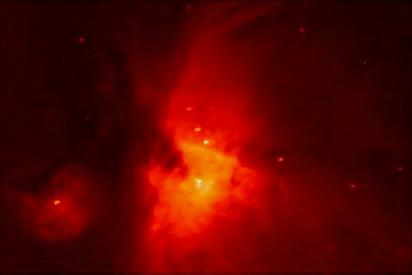 In the Balmer-alpha image (top left) we see the interstellar medium in the star forming region illuminated by the short wavelength radiation from the massive stars. The UV radiation ionizes the hydrogen. The recombination of ions with electrons result in the emission of photons. The image taken with a Balmer-alpha filter captures only those photons from excited hydrogen atoms undergoing a Balmer-alpha transition. The Balmer-alpha filter reduces the brightness of the stars in the region and enhances the details of the surrounding gas. The other two images, taken with the red and blue filters, show the stars in the Orion Nebula in better light. Jupiter imaged with the CCD camera and a Balmer-beta filter. In this zoomed out version, the four bright moons of Jupiter can also be seen. The below set of images show two different regions of the Pleiades (Krithika) star cluster. The images were taken through an R-filter with an exposure time of 10 seconds. Pleiades (M45), at a distance of 400 light years, is one of the closest star clusters. The cluster has an angular size of approx. 120 arc minutes. It is one of the few star clusters visible to unaided eye. It lies in the direction of the constellation Taurus. The brightest stars in the cluster shine with an intense blue color. The image shows Jupiter and its four bright moons Io, Europa, Ganymede and Callisto. These moons are collectively called Galilean moons. Observations on successive nights will show that the moons change their relative positions, indicating that they are satellites of Jupiter and not background stars.